truck at Fourth and 9th. Why Bimbo, we wonder? Let's ask Wikipedia to explain. The name Bimbo was first coined in 1945. The main hypothesis is that it resulted from the combination of Bingo and Bambi. Later, the founders would know that the children in Italian bimbo are told, while in Hungarian, the word means cocoon and, curiously, the phoneme used in China to name sounds very similar to bread. The corporate image, a small white teddy bear, resulted from the drawing that came to Mr. Jaime Jorba in a Christmas card, and whom Anita Mata, wife of Jaime Sendra, dressed with a white apron and a chef’s hat, as was given a loaf of bread under his arm. The Metro Gourmet deli (seen above) got one of those refits where you can't actually see through the windows any more, as they're blocked by row upon row of similar packages - in this case potato chips. It makes for a very dreary look indeed. 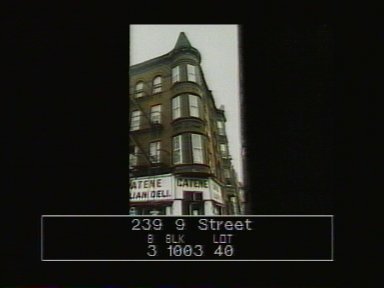 In the 80's Catene Italian deli was still at this corner, though in later years it left 239 and operated just out of 237. A classic deli, Catene's closed in 2011.